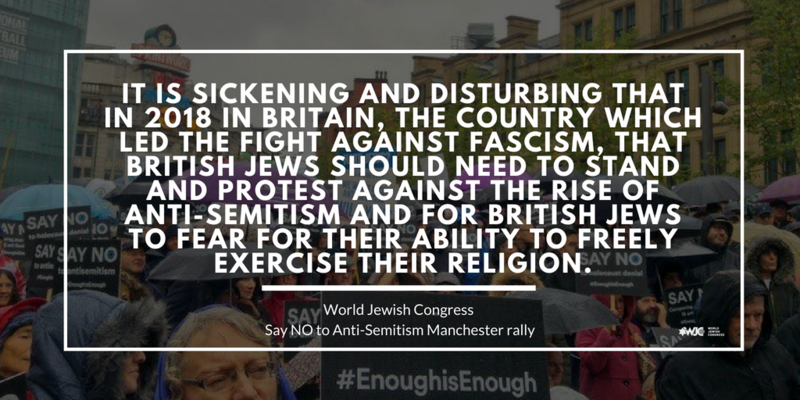 “The World Jewish Congress fully supports the British Jewish community, and our affiliate the Board of Deputies of British Jews, in its strong stand against anti-Semitism and the need to forcefully and decisively address this malaise, wherever it rears its ugly head. It is sickening and disturbing that in 2018, in Britain, the country which led the fight against fascism, that British Jews should need to stand and protest against the rise of anti-Semitism and for British Jews to fear for their ability to freely exercise their religion. We stand firmly with the Board of Deputies, with the Jewish Leadership Council, and with all other voices of reason across society in urging Labour leader Jeremy Corbyn to turn his words into deeds and to undertake all necessary efforts to combat the virus of anti-Semitism that has taken such a hold within the Labour party. 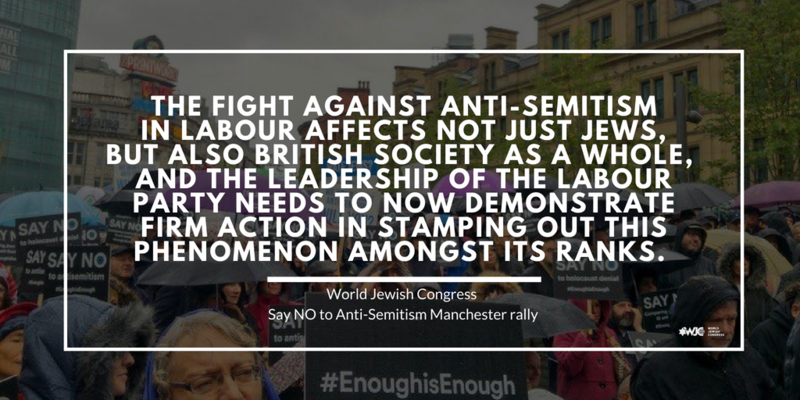 The fight against anti-Semitism in Labour affects not just Jews, but also British society as a whole and the Leadership of the Labour party needs to now demonstrate firm action in stamping out this phenomenon amongst its ranks. But such a message can only be delivered by example, and that example must come from the top – the World Jewish Congress expects to see that instead of flagrantly fraternising with people who have shown open hostility to Jews, who have denied the Holocaust, and have even engaged in the murder of Jews, the Labour leadership should now condemn the views of these people and to take immediate steps to rebuild the confidence the Jewish community once had in the Party, and to work to bring about a change in his supporters’ unacceptable attitude to Jews.